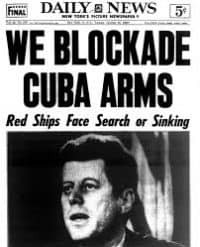 Just a year later, the United States noticed a large influx of weapons being transported from the Soviet Union to Cuba. Based on aerial surveillance, Washington realized these were nuclear missiles, capable of reaching much of U.S. territory. 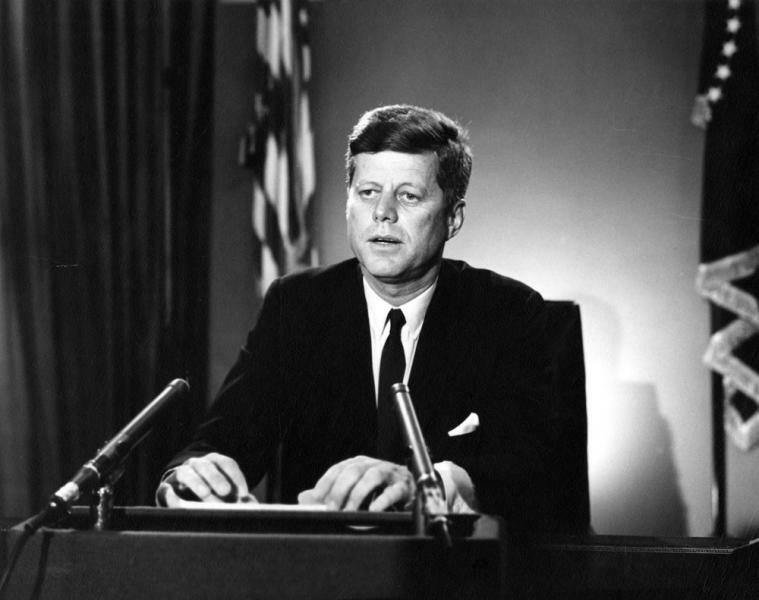 President Kennedy addressed the nation on October 22 as the world feared it was on the brink of a nuclear war. Helmut Sonnenfeldt worked for the State Department during the Cuban Missile Crisis as Office Director for Soviet Affairs. He describes how the initial lack of concern led to concerns over Khrushchev’s motives and how the crisis was resolved through the “Trollope Ploy.” His interview began in July 2000. See JFK’s speech. Read about the reaction from the State Department’s Operations Center and what it was like in Moscow during the Cuban Missile Crisis. 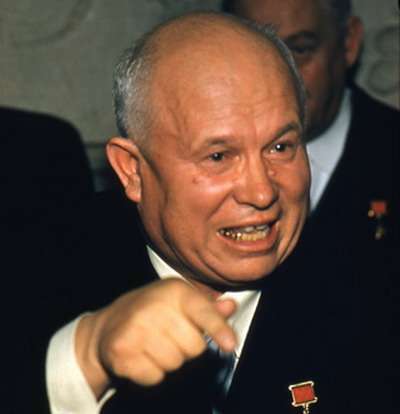 Go here for more on Khrushchev’s saber-rattling in Berlin. I think others who were working this problem and myself should have been more thoughtful about it. But there was a military relationship between the Soviets and the Cubans, which we tracked very carefully. I can’t remember when we got the first reports that they were sending some medium-range bombers, IL-28s (Ilyushin), to Cuba, which we didn’t think were that much of a problem, but were demonstrative. We had fighters and were able to watch them pretty carefully through reconnaissance and other intelligence techniques. But Cuba was becoming more and more of a Soviet military position, not just ideological and political. Actually, there was a lot of friction between the Soviets and Castro on a whole variety of grounds. Then the Russians started transferring some surface-to-air defense missiles to Cuba. That was a qualitative move, a change of the type of military equipment that had been going there. They flew reconnaissance flights down our East Coast to Cuba, outside our territorial limits, and we watched. Then in the summer of ’62, there were beginning reports and rumors and questions about whether they were moving something more than fairly modest numbers of mid-range bombers, but possibly missiles. In that respect, there were questions and disagreements. Some people were convinced. Kennedy’s new head of CIA, John McCone, thought so. There were people who theorized that the Soviets weren’t going to send SA-2s [surface-to-air defense missiles] to Cuba unless they had something very important to protect. They speculated whether there was more military stuff going in there, including missiles. We laid on extra U-2 spy planes to keep an eye on it. The first indications…as always, disputes about how to interpret them…began to come in the late summer of 1962. We were certainly getting all the intelligence that other people were getting — we weren’t photo-interpreters; we had to rely on people who interpreted. They thought the pattern of how air defense missiles were deployed resembled what the Soviets did in places where they had offensive missiles. Then, beyond the technicalities of also interpreting what were the scratches on the ground, there was the question of whether the Soviets would ever do such a thing! And that “the Soviets are inherently cautious.” This is what was always said about Stalin, although by now Khrushchev had pretty much disabused people of that general theory — that the Russians were always cautious and precisely judged the risk factors in what they were doing. 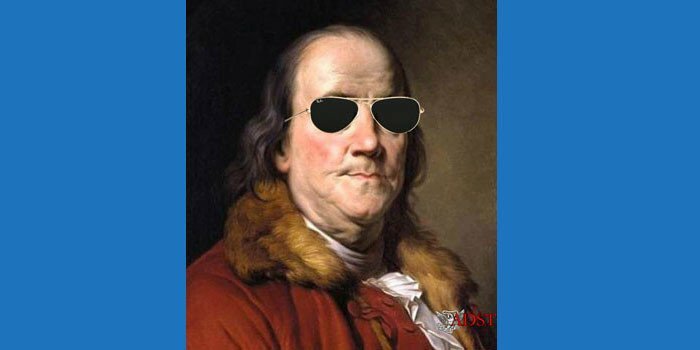 Already in the Middle East, their arms relationships with the Egyptians and the Syrians had gotten them close to potential conflicts there. They had been quite aggressive in handling our aircraft operations around their periphery. And in Berlin they had been quite provocative on a very sensitive issue for us; and then the excursion into Cuba, and into the Congo, for that matter, and other things. There was some question whether Khrushchev really was in the Stalin mold of great caution. I’m not even so sure how cautious Stalin should be viewed as having been. 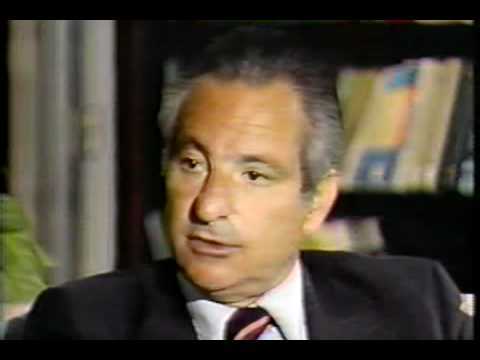 So there were debates about whether the Soviets would do such a thing as put offensive missiles into Cuba, and would take the risks and chances right at the doorstep of the U.S. But there were people who were worried how we would react if something like this came to light. A lot of this uncertainty, I guess, transmitted itself to the Soviets. Of course, they had people around here that listened in to everybody. Starting in 1962, we had a Soviet ambassador here, Anatoly Dobrynin, who was very skillful in making contacts in the high levels of the administration and among the Washington in groups of journalists and others. He was, I think, for the Soviets a very productive source, maybe a confusing source, of American thoughts and preferences and ideas that he reported back directly to Khrushchev. I’m sure it was kind of a difficult time all around, for the Soviets to determine what was going on here with Kennedy, and for us in determining what was going on in the Soviet Union. People were reluctant to accept the notion that the Soviets would do something like putting missiles in Cuba. Senator Kenneth Keating of New York made a big speech in the Senate, before we had confirmatory intelligence, but apparently based on rumors and Cuban refugees. He persisted in making an issue of it. 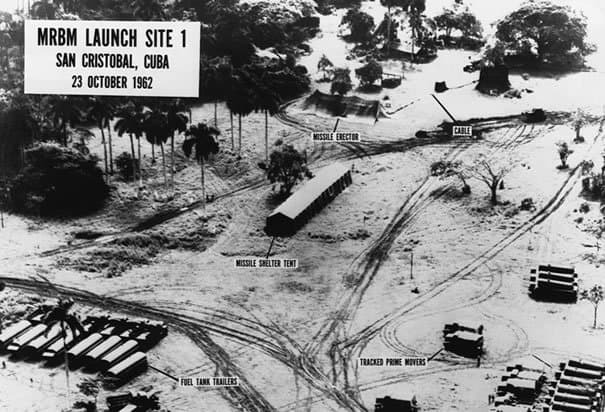 Then, of course, the intelligence community was confronted with indisputable evidence (i.e., via U-2 and satellite photos) and made the judgments that it did before these missiles became operational, and before all of them had been shipped into Cuba. Their identification was based on intelligence that showed footprints in Cuba identical to those that they were watching inside the Soviet Union for this type of missile. This was the core of Kremlinology — to see what the situation in the leadership was. During Stalin’s time, people tracked potential splits and divisions in the Politburo, and so on. After Stalin’s death, this became a fine art as well as science because there wasn’t this prestigious, tough, old fighter at the top, but the next generation of successors, who came in right at the start in 1953. [Chairman of the Council of Ministers Georgiy] Malenkov wasn’t shot, but he was exiled, basically, and demoted; Khrushchev worked his way to the top; [Chief of Soviet security, Lavrentiy] Beria, the chief cop, was executed. There was a lot of turmoil in the leadership before Khrushchev began to sort of stabilize his position. The questions of who’s on top and who’s against whom were very much a matter of constant concern. We weren’t so sure when this problem developed in Cuba, and a lot of study has been done since. In those days we weren’t sure, although we suspected that Khrushchev was pretty much on his own in running this missile deployment….It wasn’t clear to us how it really stacked up in the Politburo. Of course, anything that leaked out of the Politburo in the end always showed a substantial majority, if not unanimity. I think those reports didn’t really get in deep enough, because our intelligence was good, but not so good that you could really penetrate in the depths of it. By the time of the Cuban missile crisis, Khrushchev appeared to us as something of an adventurer — somebody who wanted to be sure that everybody realized that the Soviet Union was a great power, and a global power, as we’d say now. Soviets said, even Foreign Minister [Andrey] Gromyko would say, “There’s no problem anywhere in the world which can be settled without the Soviet Union,” and so on. Khrushchev was seen as something of a risk-taker. What I think we missed, in my view (this is hindsight, although I had some feelings about it shortly after the missile crisis was over), was that Khrushchev wasn’t moving from strength; that in fact, he was in a contest with the Chinese, which was getting more and more serious; and that his own situation vis-à-vis the U.S. was not as strong as he had believed, or we had believed, or others had believed; and that he was, therefore, looking for ways of demonstrating his power or at least of buying time. My view at the time was somewhat different from other people’s views, which linked the Cuban crisis very closely to breaking the logjam in Berlin. That is, they felt that Khrushchev wanted to threaten us with missiles in order to make clear to us that we couldn’t escalate a conflict over Berlin without a risk of serious damage from several directions to our homeland. My feeling at the time was that he was trying to make up for the ground that he lost after bluffing with his strategic missile advances, starting in 1957, and having been discovered as a bluffer. We announced this to him in the Gilpatrick speech, but we announced it in other ways as well. He needed something to tide him over so that he wouldn’t have to pour additional resources into what had now become a real race in the offensive area. I thought that was a more weighty reason for his going into Cuba than trying to break the logjam in Berlin. In fact, I…gave an extemporaneous talk at Johns Hopkins in which I suggested rather boldly that the eventual collapse of the Soviet Union, not quite 30 years later, was foreshadowed in Khrushchev’s getting the Soviet Union into a major and continuing arms race with the United States, which economically bankrupted them. As I have said, theorizing about Khrushchev’s motives and intentions went on throughout the crisis. But once the offensive missile deployments in Cuba were established without doubt by our intelligence, we went into crisis mode. INR [Bureau of Intelligence and Research] obviously didn’t make policy – despite the inclinations of its Director, Roger Hilsman, to help out in this respect – but we concentrated our analytical products on the growing information flow and on assessments of probable Soviet responses to the several U.S. actions that were being considered. We were also under siege from the press, which in those days had virtually complete access to the State Department building. Alert reporters quickly noticed when lights were burning all night in Soviet Affairs and some Latin American offices, as well as in the executive offices on the Seventh floor [where the Secretary, Under Secretaries and several Assistant Secretaries have their offices]. We were obviously sternly instructed to keep our mouths shut. The prominent diplomatic correspondents who smelled a rat held their fire when requested, but still tried to gather information for later use. We got read-outs from the specially created “EXCOMM” (the Executive Committee of the National Security Council) and were aware that President Kennedy would address the nation on Monday evening, October 22, 1962. We gathered that collective speech-drafting was underway. Ironically, Soviet Foreign Minister Gromyko was in the U.S. for the annual UN General Assembly meeting, and he was meeting with both the President and Secretary of State [Dean] Rusk about the usual agenda. 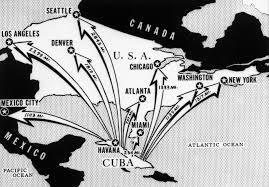 We heard that on Cuba, he assured each of them that all Soviet activities regarding Cuba were defensive. From what trickled down to our level, we wondered, and wrote in a brief analysis, how much and indeed whether Gromyko knew what was going on in Cuba. Once Kennedy had spoken, we analysts in INR looked for Soviet reactions, public and private. The official U.S. position, insisting on Soviet withdrawal of offensive missiles already deployed and the turning-around of ships bringing additional ones, was elaborated by Adlai Stevenson, our Ambassador at the UN. As Kennedy’s speech had made clear, the U.S. was imposing a “quarantine” around Cuba. This produced lively polemics by the Soviets in New York, Moscow, Washington and in all the other channels. 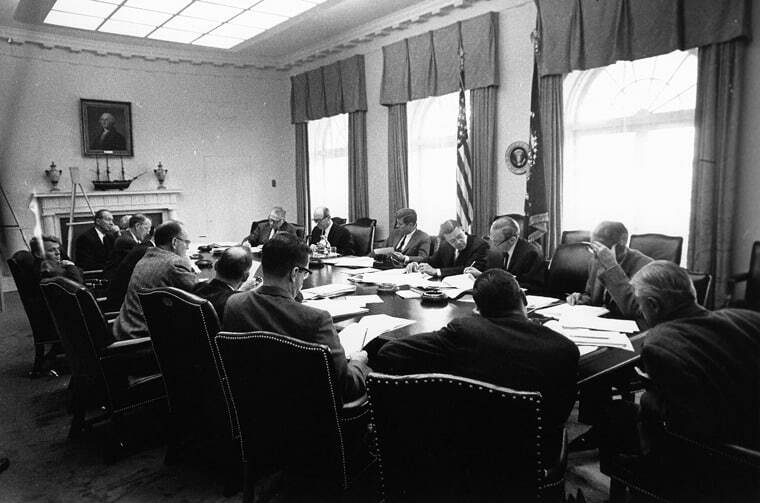 Before Stevenson’s main address, Hilsman took me along to an Oval Office meeting where the text was being mulled over. I was struck by how much time and effort, from the President on down, was being devoted to precise wording and even to the rhythm of the speech. Whenever someone came up with an especially felicitous phrase, there was praise by the President and then by [National Security Advisor McGeorge] “Mac” Bundy, speechwriter Ted Sorenson, and court historian Arthur Schlesinger. The latter two eagerly contributed their own preferred formulations. Somewhere in the back row, there was an NSC [National Security Council] staffer who cautioned the drafters about accuracy and a legal expert who made sure that no threats were uttered that might contravene international law. Inevitably, as the group dispersed, someone (maybe Kennedy himself) came up with the old saw that this had been “the most distinguished gathering since Thomas Jefferson dined alone.” Stevenson eventually got full TV coverage of his UN presentation, including especially his dramatic clash with Soviet Ambassador Valerian Zorin. I hunt-and-pecked away at my typewriter as I tried to figure out and write a report on the pattern of Soviet behavior. In particular I was trying to figure out when the first encounter between the U.S. Navy and a Soviet missile-carrying vessel would occur. Along with several signals in the corridors of the UN and elsewhere, we received some indications from the journalist John Scali (who had been in touch with a Soviet KGB officer who masqueraded as their Embassy’s press officer) that a deal might be had if we could do something about our missiles in Turkey and give commitments not to invade Cuba again (a la the Bay of Pigs). Scali evidently contacted half the EXCOMM on this. But as the week following Kennedy‘s speech drew to a close, my memos (subjected to close scrutiny by Hilsman) began to sense a pattern of Soviet second thoughts. Soviet ships challenged by U.S. destroyers were turning around. After a few nights sleeping on a cot in my office, I went home for the weekend, having written a short memo analyzing Khrushchev’s hard-nosed public letter to Kennedy. As I was dropping off to sleep in my bed at home, the phone rang: our Duty Officer was calling to say that there was a private letter from Khrushchev which seemed to unravel the “knot” about which Khrushchev had warned publicly. I rushed back to the office, and was told that [Attorney General] Bobby Kennedy had already urged the President to ignore the public letter and to respond to the private one. This, of course, was not our call to make, but as I recall, the memo we wrote concluded that the private letter was indeed the more valid message. The U.S. response became known as the “Trollope Ploy” [a negotiation technique named after an incident from an Anthony Trollope novel, in which a woman interprets a casual romantic gesture, such as squeezing her hand, as a marriage proposal]. Much was to follow in the weeks and months to come to formalize the deal that got the Soviet missiles withdrawn from Cuba. We did what we could to feed judgments about Soviet intentions to John McCloy, who headed the post-crisis haggling with [Soviet statesman and Khrushchev confidant Anastas] Mikoyan, his Soviet counterpart. My colleagues and I could then begin to devote time to reflecting on what had happened, what it meant for the future, and why the pre-crisis National Intelligence Estimate had on balance concluded that Khrushchev wouldn’t run the risks which he ended up running. As it turned out, one of the follow-ons to the missile crisis was a substantial improvement in Soviet relations with the U.S. Kennedy’s American University speech in 1963 led to the Limited Test Ban Treaty being negotiated, along with the U.K. It wasn’t really much of an arms control treaty, since underground tests continued. It was an environmental treaty, because it ended atmospheric tests. There was some feeling (in my case a stronger feeling) that perhaps Khrushchev was trying to cool the frictions with the U.S. a bit, after suffering the setback of the missile crisis and basically having to give up on his efforts to create a separate regime in Berlin via the free city proposal. Maybe he wanted to gain some time. Not long afterwards, Kennedy was assassinated, and there was some worry in Moscow because the man who was caught had lived in Russia.